We'll help you become master of the multiball. It took a couple of months, but Smash Hit is the first game to dominate mobile without copying Flappy Bird. In fact, it's an entirely different experience. 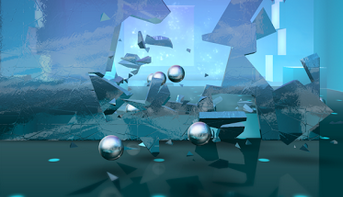 Viewing the action from a first person perspective, players break crystals will silver balls in the hope of earning more while traveling as far as possible. Run out of balls and the current game ends. If you can't beat your high score, there's good chance you commit one or more of these Smash Hit mistakes. Smash Hit is all about precision. Don't rapidly tap the screen, otherwise you'll waste all of the balls and subsequently lose the current game. Always know how many balls are left, and break crystals with deliberately measured taps. You need to break crystals blocking the path, but don't focus too much on these objects. One or two balls is all you need to clear the way. Instead, go after the blue crystals. Each one you break gives you more balls. Hit 10 or more in a row to earn a multiball. While on the subject of stuff getting in the way, smacking into one of these objects results in a quick game over. You lose 10 balls every time. This power-up lets you unleash multiple balls with a simple finger swipe, but there's a timer at the top of the screen. It's easy to keep swiping after this timer runs out, and now you're wasting balls like a crazy person. If you don't hit one blue crystal the first or second time, move on. Don't waste more balls than you'd receive for breaking it. Here are more tips to improving your Smash Hit score.